Running, skating and bike riding are among the most popular activities with visitors from our Destination’s Natural Markets. Since its inauguration in March 2015, the Nuevo Vallarta Bike Path has become a welcome attraction to enjoy in the Riviera Nayarit. Every day, tourists and locals come to run, skate or cycle along this recreational trail. The Fraccionamiento Náutico Turístico Nuevo Vallarta neighborhood is home to many of the Destination’s hotels, which is why building the bike path was an excellent decision on the part of the Nayarit State Government for continued development of this microdestination. The bike path is nearly two miles long and follows the Avenida Paseo de los Cocoteros, just a few yards from the beach. As they meander down the trail visitors can enjoy the diverse flora and fauna of the area, especially the birdlife. Bicycles have recently grown in popularity in Mexico, with both families and cyclists as a community always seeking safety, which is something the bike path offers with its well-placed street and transit signage. It’s a known fact that North Americans love to run, and here they’ll find a great space to indulge their pastime when they visit Mexico’s Pacific Treasure. 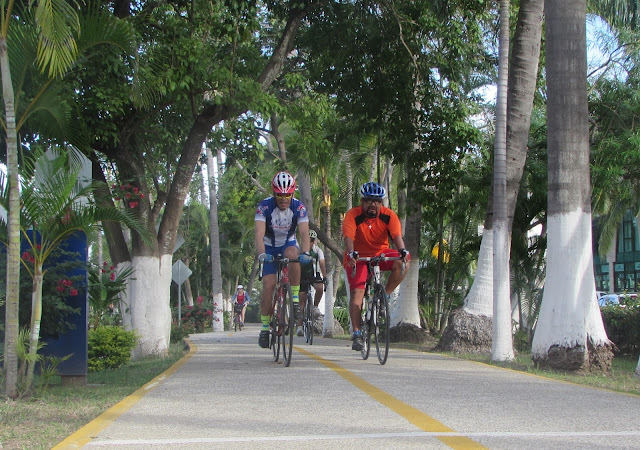 The Riviera Nayarit hosts several races during the year, including a 5K, 10K and even a Tourism Half Marathon; thus the bike path has become an ideal spot for training and preparing for the competitions. Brazil, one of the Emerging Markets of interest to the Riviera Nayarit, is also known for its runners. In fact, Brazilian journalists in town for a FAM trip participated in the last Tourism Half Marathon. In case two miles isn’t quite long enough, the bike path connects with the Maestro Flamingos Condominium walkway, which extends another nearly two- and-a-quarter miles until it connects with the road. This segment also offers a chance to get on the road to Bucerías via a path that begins where the hotels end in Flamingos.